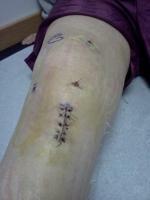 I ruptured my ACL and partially tore my MCL in my left knee while skiing December 20th. I had minimal swelling but because I injured myself around the holidays, I couldn't see a doctor or get an MRI until much later after new year's. It's been about 11 weeks already and I've been going to physical therapy twice a week since late January. My MCL is fully healed, according to my doctor and I finally have around 100 degrees of flexion as well as full extension. I've been reading around and it's been suggested to reach full range of movement before surgery. My right knee has a total of ~140 degrees and right now I have surgery schedule in two weeks. Is that fine? I go up stairs and walk around normally. I only wear my brace because campus is rather crowded and I'd rather not have my knee kicked out from under me by accident. I'm really worried about having my surgery in the middle of a week that I have school. My university does have special on-campus transit for injured students, but the surgery is on a Wednesday of all days. It sounds like the anesthesia really knocks out some people and the pain doesn't sound like the best thing in the world. Should I even try going to any of my classes the two days after the surgery? It seems like that would just worsen swelling. My parents also keep trying to convince me to put off the surgery until late May. I don't know if that would be a good move or not. Part of me wants to get the surgery over with as soon as possible. I already go to physical therapy twice a week, so I'm not sure. And during the summer, I plan on taking on a research internship. I'm just confused and not sure what I want to do. My doctor says it's fine this month or in May, and I just want as smooth a recovery as possible.